I didn’t notice the difference between Cobalt and North Cobalt while driving through the area the first time, but my recent trip to the Temiskaming region confirmed that it is indeed separate and distinct, even if only by a few minutes’ drive. 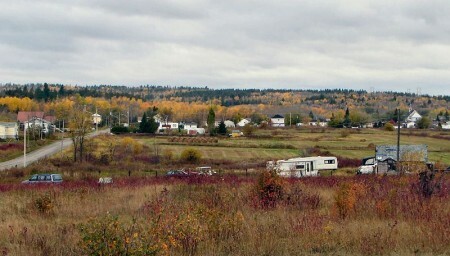 North Cobalt is a former mining camp established right between the towns of Cobalt and Haileybury during the silver rush in the early 1900s. It was a stop along the Nippissing Electric Railway that ran from Dymond to Cobalt. Along with Haileybury, North Cobalt was destroyed by the fires of 1922. The North Cobalt Flea Market isn’t a true flea market in the usual sense of the word – it’s more like a liquidation place like the Bargain Shop or a going-out-of-business BiWay that sells everything it can get its hands on. 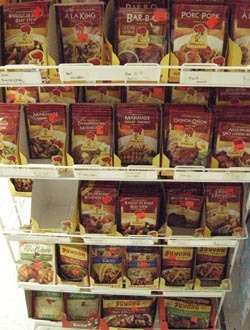 On my first trip, however, they had a whole whole wall full of St-Hubert sauces and mixes. Now, it’s only a rackfull. I’ve bought some each time I’ve driven through town. I love St-Hubert. Catholic Church. I read in the Toronto Star once that there is an egg grading station in North Cobalt. I also found the Maiden Bay Camp, which is on a rural road in North Cobalt. It seems there are some abandoned towns nearby as well. You could also venture off the main road to visit some “ghost towns“, although in northern Ontario a “ghost town” is usually just a razed or abandoned settlement – nothing like the fully-intact, faux-fronted, tumbleweed-infested ghost towns of western legend. North Cobalt does, however, have Devil’s Rock, which provides hiking and a nice view of Lake Temiskaming. Haileybury tries to claim it, but I have the good word of a Tri-Towns resident that the devil lives in north Cobalt. 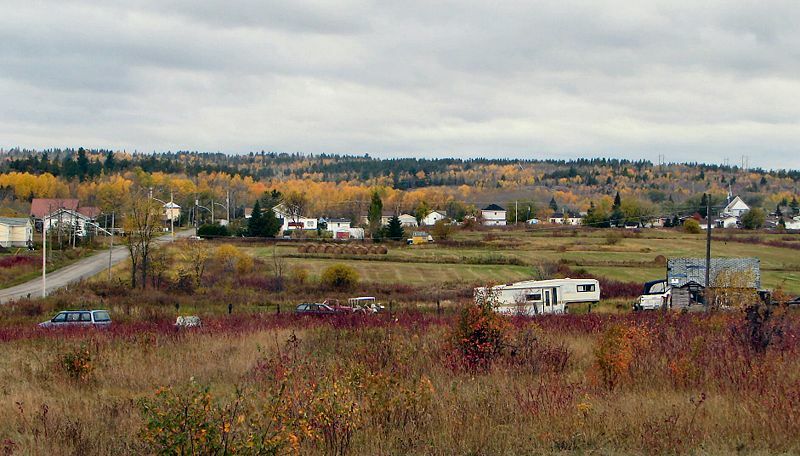 North Cobalt became part of Haileybury in 1971 and has been part of the town ever since. I don’t know if a separatist movement exists but considering its northern Ontario, there probably does. This entry was posted in Temiskaming and tagged hiking by Highway11.ca Editor. Bookmark the permalink. Hi i live in saskatoon now but from 1951 to 1962 i lived in north cobalt. Our family name was burgler. I went to school with your brothers. My dad worked at silver Miller mines,my friends were glen Perry and Jean denal. We had a farm just off pohacka road. Our naibours were the tinklers and the Cranstons. If you want info re Charlie Sargeson, my Grandfather please contact me. Linda, I believe you are looking for the *Temiskaming Speaker* newspaper of New Liskeard, Ontario. The article “Jury Exonerates Driver In Saturday Accident” about William Brennan’s accidental death appeared in the August 24, 1939 edition (pages 1 and 8). My maiden Name is Linda Berube and I was born in Timmins. I am looking for info on the Newspaper that existed around August 1939. My Great Uncle William Brennan is in the St Therese Cemetary there. Uncle Willie was killed by a hit and run driver who left him to die in the ditch. We are looking for the newspaper that had the article for our family records. Can anyone help us. Thank you so much. One of my great grandmother’s brothers (I’m now 54) lived in Cobalt many many years ago, probably in the early 1900′s. Their last name was ‘Clarke’. A lot of the family lived in and are buried in Harrowsmith (and vicinity), Ontario (north of Kingston). I have a photograph of both of them and his wife that was taken in Cobalt. Wish I could upload it here. Perhaps there will be a feature to upload pictures here in the future? Cobalt is another northern Ontario historic place to visit. I enjoyed taking a trip there. I am working on \”The Warren Family Tree\” and I do know that one brother of this family from Collingwood, moved to Cobalt, and my Grandfather, Jack Warren, was a engineer on the train from Collingwood to Halibury. Does anyone have information on this family. Hope to hear from you. Hi. My name is Stephanie Maidens. My great grandfather (Fred?) Maidens married an Anne Warren and the Maidens family was around Collingwood. A Norman Maidens worked a mine around Cobalt in the 1920′s. There was a town named Maidens and there is Maidens Bay on Lake Temiskaming. I’ve been trying to do the Maidens Family Tree. We lived in North Cobalt…Station St. actually from 1984-1987. We lived opposite the Catholic school which is adjacent to the cemetery. Is the Post Office still there? Many happy memories of picking up our mail from there and chatting with the neighbours! I just stumbled across this, random, North Cobalt will never be haileybury, the movement exists. There are 3 baseball fields and the snowmobile trail runs through north cobalt. Devil’s Rock is definitely in North Cobalt!